We love the Paddle Palace backpacks! 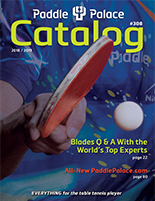 Designed by Paddle Palace for table tennis players. Top quality fabric and sturdy construction. Very practical and user-friendly with individual pockets for all your table tennis gear. Outside pockets and main backpack openings all zip from both directions with sturdy zippers. Pocket on outside front is the perfect size for holding your paddle and paddle-shaped case, and it also has multiple slots and pockets. Main body of backpack has two large organizing sections. One section is padded and ideal for holding a laptop computer or other important gear. Tall pockets on each side of exterior for water bottles, cleaner, and more. Carry as a backpack or use the convenient carrying handle. There are matching Paddle Palace Paddle-Shaped Cases, and Paddle Palace Rectangular Cases.